For this price, from a top brand, none. 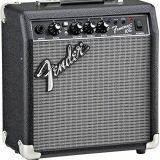 Great practice amp option, Fender quality and top value. mall practice amps have been a mainstay of the music industry since they first appeared in the early 1900’s. Back then, small valve amps had a single volume control, AC power and bizarrely, no on/off switch. Fast forward 100 years and we have dozens and dozens of options for all budgets. 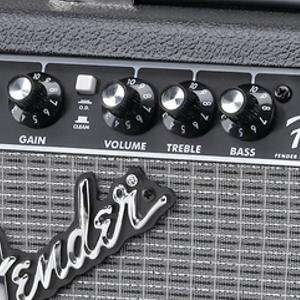 Whether you’re a first time player who needs a bedroom amp, or a seasoned player who needs something to travel with, there are lots of scenarios where a small guitar amp is a winner. 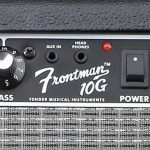 In this review, we look at one of the most popular small amps available, the Fender Frontman 10G. 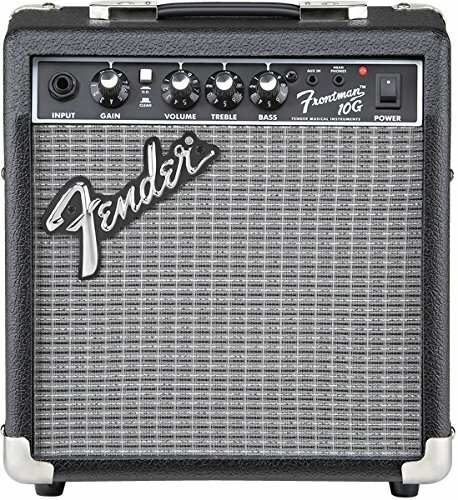 As the name suggests, the Fender Frontman 10G is a 10 watt solid state guitar amp. 10 watts is enough to practice on alone or with another musician. With such a small speaker and casing, the sound will not carry far or be able to contend with drums. The features are pretty amazing for an amp that costs so little. It’s important to note that there is just one channel, with an over-drive switch. This means that you can play with a clean tone, dial up the gain to give a bit of crunch. Then when you want more distortion, just hit the over-drive switch. A headphone output is a real must in a practice amp, as they are so often used in small rooms or homes, where being able to play silently is so important. The addition of the aux input means that you can plug in an MP3 player or CD player and play along to your favourite songs or backing tracks. What sorts of instruments will work? 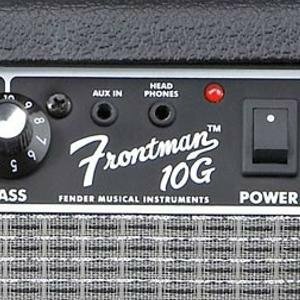 Whilst this is sold as a guitar amp, you can definitely use other amps with the Fender Frontman 10G. Keyboards, bass guitar and vocals are the obvious options. However, even other stringed instruments like violins will be fine. Any instrument that can plug into a standard input jack will work. If your instrument doesn’t have a pickup, then a standard mic could be used to amplify the sound. So what about the sound? Well, it’s actually louder than you’d think, though at high levels, the small speaker and casing means that you’ll lose a lot of bass and depth to the tone. The 2 band EQ (Treble and Bass) gives a pretty nice ability to alter the tone, so you’ll be able to brighten or dampen the tone, depending on the instrument and the application. The overdrive button will kick in some distortion that will allow you to get a pretty nice result for more rock and metal styles. It’d be great if there were two channels so that you can switch between a clean and gain tone, without having to alter the amount of crunch. However, that’s too much to ask for this price range. If you need that type of feature, then check out our Ultimate Gift guide, where we look at several mid priced amps that will do the trick. For the price and the size, this amp ticks pretty much all the boxes that you’d expect. Fender quality means that you won’t need to worry about the amp breaking or falling apart, unlike some other options in this price range. 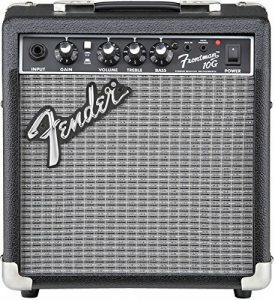 If you’re after an affordable practice amp, you won’t be disappointed with the Fender Frontman 10G.